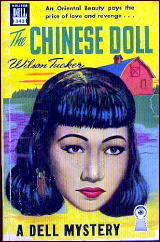 » Reviewed by William F. Deeck: WILSON TUCKER – The Chinese Doll. This is embarrassing. I’ve read several of Tucker’s SF novels, but not a single one of his mysteries. I’ve always meant to, but I’ve just never gotten around to it. If anyone has read THE CHINESE DOLL recently and can explain what Bill might have been referring to in his last paragraph, I’d really like to know! I’ve only read RED HERRING which apparently is the last Charles Horne book. I liked it well enough. A bit familiar with the dangerous dames and the tough thugs and the double crossing, but a good read. Yet another cryptic remark by Bill Deeck that has me tempted to read the book to find out what he means. But after my experience with CRAZY TO KILL I think I’ll pass.